It wasn't how I had planned to spend the evening. Instead of lounging in the comfortable sitting rooms of the hotel we were holed up in our room frantically dialing phone numbers. What is usually a simple task, finding lodging for the next night, had turned into an impossible search. 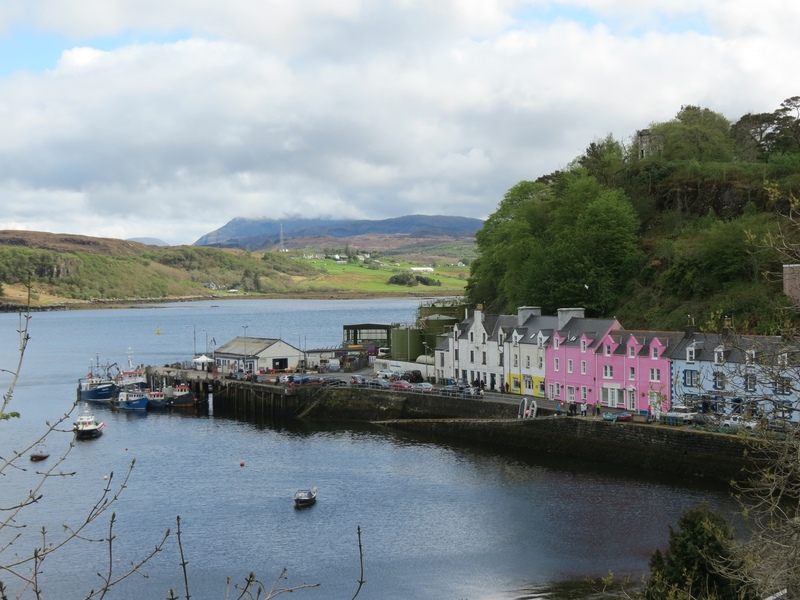 We had planned to stay Portree, the capital of Skye and an attractive town on the coast. 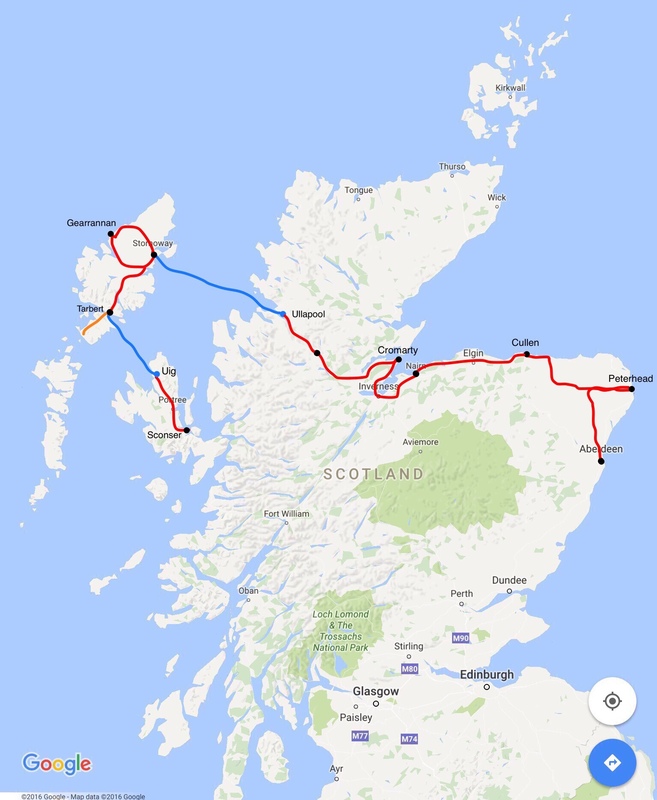 But after literally dozens of tries, it was clear that the whole world was staying in Portree this weekend, and were were not going to be some of them. 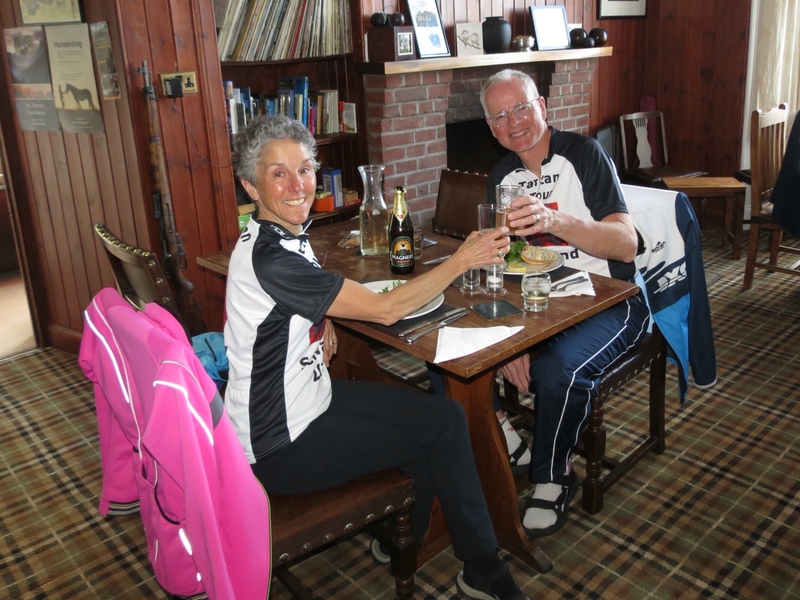 At last, a cancellation at a lodge about 14 miles further landed us a twin room. We took it. Arriving on the Isle of Skye, I was immediately taken with the intense green landscape. 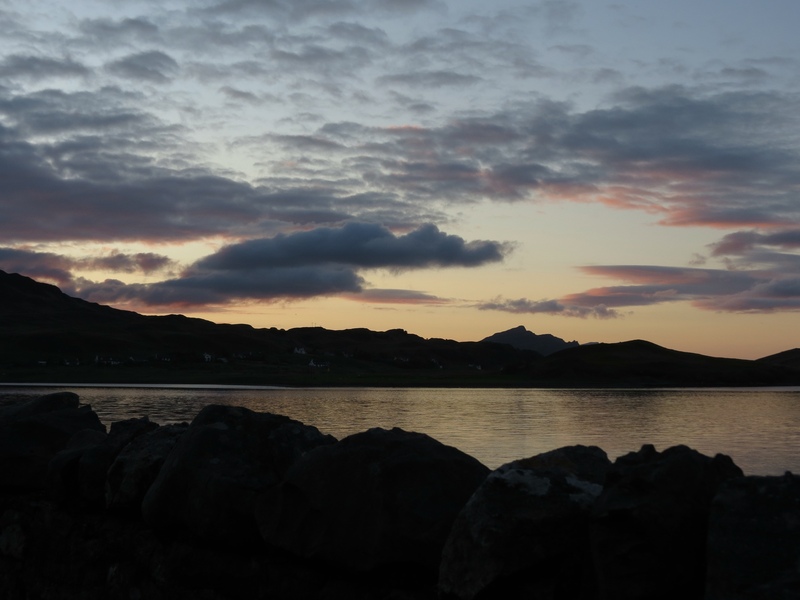 After the barrenness of the Outer Hebrides, it felt like we had returned to spring. Gorse bushes once again flowered on the roadside and the hills were covered in a green carpet. We climbed out of Uig then followed valleys that offered spectacular views and little in the way of steep hills. And for once, the wind was mild. We dodged the rain that fell mid-day and cycled under mostly sunny skies. And just as I expected of Scotland, it showered on us now and then but never enough to be a nuisance. Cycling was easy and life was good. Portree turned out to be a pretty and bustling little town. All those tourists inhabiting the guesthouses were strolling the streets in the sunshine, popping in and out of attractive little shops that populated the town center. It was disppointing to know we could not stay to enjoy its offerings. But we did make a successful stop at a bike shop for a quick repair to my brakes and take time to photograph the town's iconic view. The further we got from Portree, the more dramatic the landscape became. The verdant fields were replaced by striking mountains. The closer we got, the more unnerved I became. I knew the road made a sharp turn back to the water, but for the life of me I couldn't see how. It felt like we were in the middle of nowhere. Suddenly we plunged downhill into a town, and the promised turn materialized in front of me. Soon we were sailing alongside an inlet. With the sun on our backs as well as the wind, it was sweet cycling. 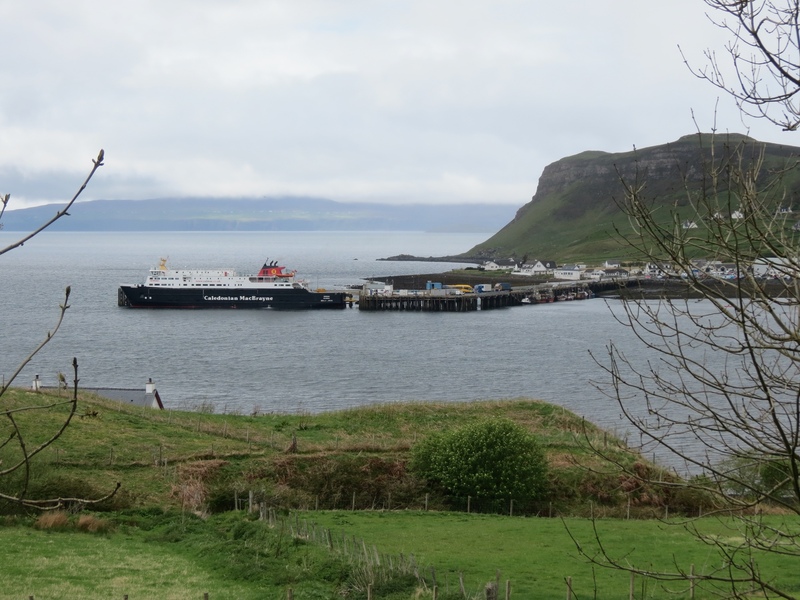 At the mouth of the inlet we rounded a curve that brought us to the channel between Skye and the island of Raasay. 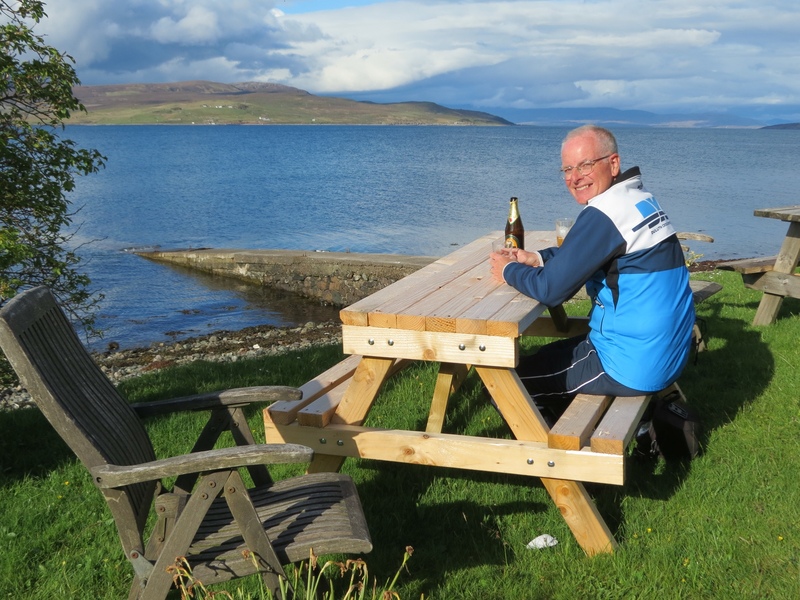 Amid calm water and placid views we found Sconser Lodge nestled right against the shore. 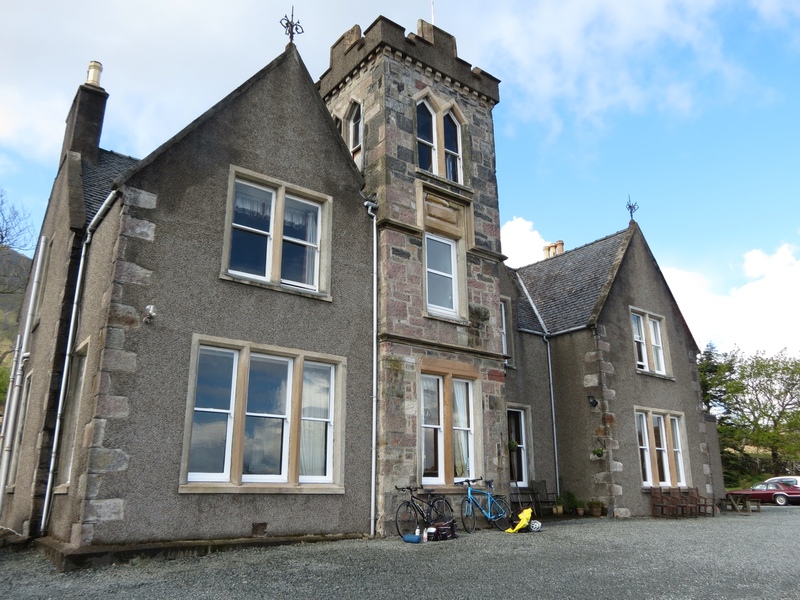 A majestic old building with a warm and friendly hostess soon confirmed our initial impressions. Striking out on lodging in Portree was indeed our great luck. As it was our 33rd wedding anniversary, it felt heavenly to be in such a beautiful spot for the evening. The place had the feel of an old hunting lodge, with dark wood, a cozy bar with a gentle fire burning, and a small lounge with an enormous window overlooking the water. I immediately proclaimed a “no internet” rule until after dinner. This was a place to be savored. First requirement, drinks outside next to the water. The season's long days left plenty of sunlight, and the picnic tables were still in the warm sun. With our now customary glasses of cider, we lingered and watched the ferry shuttle back and forth to the island. For dinner we didn't have to go any further than the bar. It was a jovial place and we preferred the general hubbub of the patrons to the quiet formal dining room. From the apple crab salad starter to our main courses of steak and lamb, our dinners were prepared to perfection. Our good fortune continued. We settled ourselves in a comfortable leather couch in front of the large picture window for the remainder of the evening. The setting sun provided ever changing color in the sky, and the stillness of the water was extremely peaceful. 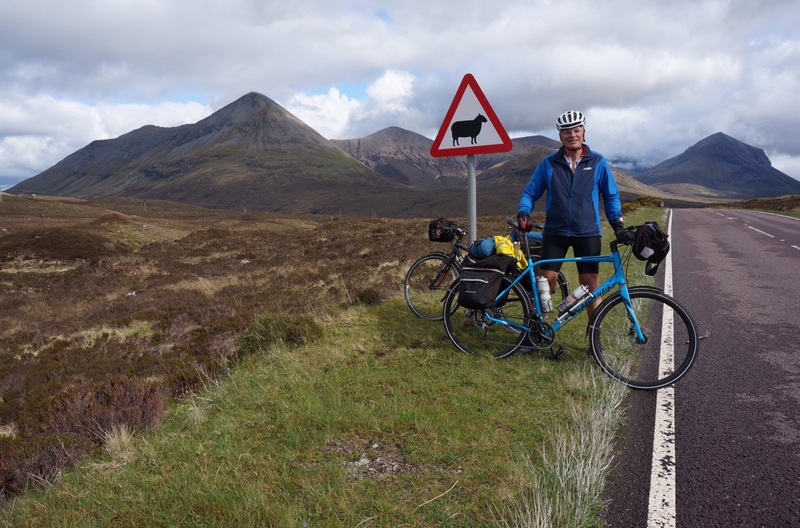 Yes, luck was with us on the Isle of Skye.